The Bus Terminal Controllers BC3100 and BC3150 are Bus Couplers with integrated PLC functionality and have a fieldbus interface for PROFIBUS. They are intelligent slaves and can be used as distributed intelligence in the PROFIBUS system. In the BC3100 Bus Terminal Controller, one unit consists of the controller, between 1 and 64 terminals, and a bus end terminal. The Compact BC3150 Bus Terminal Controller is housed in a cost-optimised and compact housing. Unlike the BC3100, the BC3150 supports up to 255 Bus Terminals via the K-bus extension. Both PROFIBUS controllers offer automatic baud rate detection up to 12 Mbaud and two address selection switches for address assignment. 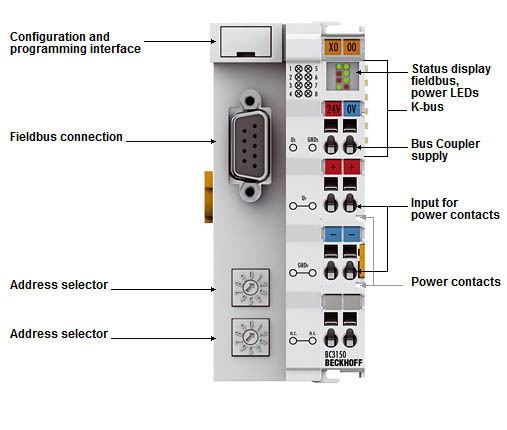 The Bus Terminal Controller is programmed using the TwinCAT programming system according to IEC 61131-3. The configuration/programming interface of the BC31xx is used to load the PLC program. If the software PLC TwinCAT is in use, the PLC program can also be loaded via the fieldbus. The inputs and outputs of the connected Bus Terminals are assigned in the default setting of the PLC. Each Bus Terminal can be configured in such a way that it exchanges data directly through the fieldbus with the higher-level automation device. Similarly, pre-processed data can be exchanged between the Bus Terminal Controller and the higher-level controller via the fieldbus. The programming system TwinCAT for the BC3100 and BC3150 operates, independently of the manufacturer, in accordance with IEC 61131-3. The PLC programs can be written in five different programming languages (IL, FBD, LD, SFC, ST). In addition, TwinCAT offers extensive debug functionalities (breakpoint, single step, monitoring), which facilitate commissioning. It is also possible to perform adjustment and measurement of the cycle time. Input current 320 mA max.